DANCE – KNOW THY AUDIENCE! For some time now I have been wondering, and making comments, on the audience of Dance. I believe that the performance of ballet professionals and the big companies’ stagings were more foccused on pleasing dance experts and the conservative part of the audience, neglecting a wider one that could and would enjoy Dance, and ballet, it just some changes were made…This was more a feeling that a certainty, and of course I could be wrong. 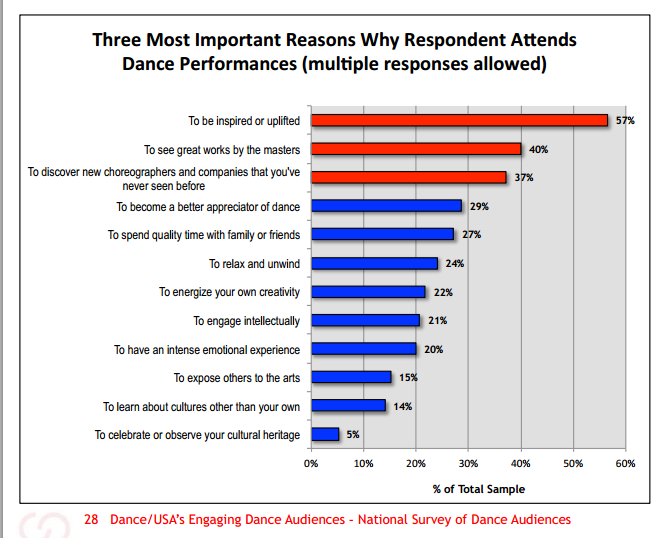 But I have found a survey about audience made in 2010, in USA, comissioned by Dance/Usa , a national service organization for the professional dance field, within the scope of one of their initiatives: EDA – Engaging Dance Audiences. The survey was made by WolfBrown, a specialized agency that provides ” qualitative and quantitative market research services to a wide range of cultural organizations.” In total, 7,454 dance patrons completed the survey. – Active or Serious Dancers are people who regularly take dance lessons, perform in front of live audiences or choreograph. They constitute 2 out of every 10 buyers. I suppose this means: they are either active dance professionals or actively training to become professionals. 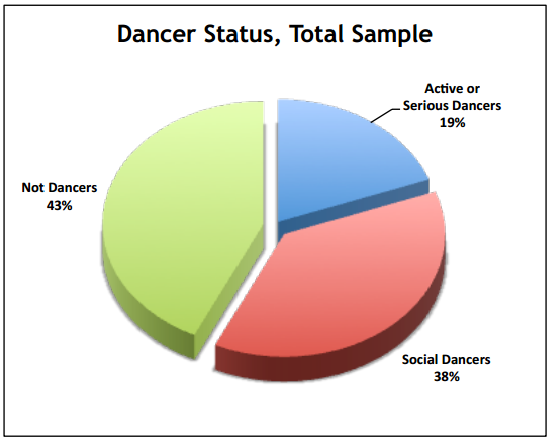 – Social Dancers are people who dance socially, either regularly or occasionally, but who are not “Active or Serious Dancers.” They constitute 38% ot the audience – this means 4 out of 10, and among these, 3 are ex-dancers. – Non-Dancers are all those not included above. They constitute just 43% of ticket buyers! “To experience the kind of magic only Dance can create” is not an item in their list… No wonder, as my clumsy, unprecise concept of “magic” means the kind of experience you have when exposed to Art: an experience that may be anywhere from the most subtle, unconscious to the most overwhelming one, but always touching deep existential strings. Note that “to have an intense emotional experience” is low on that table, while “to be inspired and upflifted” is at the top. I imagine that respondents, like me, regarded the top one as a life-changing experience, and the “intense emotional experience” as any kind of “emotional”, including the predictable, shallow kind that newspapers and trash-talk-shows use “ad nauseam” to increase their sales. So I chose the top one as the closest, in fact as a synonime to my “magic”, and hope I’m not pushing it too far – because “magic” in the top position agrees with all I believe in! The report states that to Active or Serious Dancers the most important motives are: to engage intellectually with the dance or choreography / to energize your own creativity / to see great works by the masters / to discover new choreographers and companies. This is a pragmatic group, they want to enhance their skill and specific knowledge. It follows that “To be inspired and uplifted” stands on the top of the list because the Social Dancers and Non-Dancers want it, it’s THEIR principal reason. If no real “magic”, nothing really special is created, it will be a disappointing experience to THEM. The performers on stage know that their peers are a large part of audience (roughly 60%) – with their keen, knowing eyes hefted on the smallest movement, possibly looking for faults! I wouldn’t be surprised if the wish to concquer their respect and praise became stronger than anything else…. That’s why I love performers who are more foccused on creating magic than in showing off their excellent technique. Remember: the most important motivation to see any kind of production, to a large part of the CURRENT audience, is the wish “to live an inspiring experience” – it probably is also the motivation that can win more “outsiders” over. 3 have mixed feelings about this (still hope on them!). But there is an exception, and an expected one: when it comes to ballet productions, 45% prefer familiar works – the conservative traditional-ballet-loving audience I always talk about! The survey also tried to find out about technology-based alternatives of watching a performance. All groups prefer live-performances (OF COURSE!, who wouldn’t? ), so interest in technology-based viewing is not that big. Anyway, two conclusions stand out for me: the younger the audience, more interested in technology-based possibilities they are, not instead, but ALSO! A clear trend! The only exception is about sites with pay-per-view performances – these interest all ages and groups almost the same way. These results must be viewed cautiously, of course. WolfBrown analyzed north-american audiences, in other countries they may have a different behaviour, and great companies like NYCB and ABT did not adhere to the survey. (If I were bold, I would bet that Non-Dancers are an even smaller part of the audience of the great companies…) Even so, to me these ARE interesting results, in that they prove that my complaints are not without reason, and in that it is the only effort to analyze Dance Audience that I know of, so far. Next > So they are “hot” ballet dancers. Good!